It is hard to encapsulate the numerous experiences I had working with Lacrosse the Nations in Charlottesville, VA. Hopefully, I will be able to give you just a glimpse of what it was like to watch the kids grow, learn and get better at the sport I love. To preface my summer as the LtN intern in Charlottesville, I would like to share a little bit about myself. I am a rising sophomore at Princeton University where I am a member of the Women’s Lacrosse Team. I grew up in and went to high school in Charlottesville and have been involved with LtN for over 5 years. My involvement and commitment to LtN has taken many forms: fundraising, organizing 4v4 tournaments, sponsoring a team in the LtN Cup, running gear drives, and even travelling on a service trip to LtN in Nicaragua. Most recently, I have been serving LtN as their summer intern, working alongside Natalie Wood, the Program Director in Charlottesville and of course, Javier (LtN's Executive Director). During my first year at college I was constantly thinking of ways to continue my support of LtN and its mission. At every opportunity, as new gear shipments came flowing into our locker room, I encouraged my teammates to donate their “gently-used” equipment to LtN and I rounded up goggles, cleats, goalie pads, and sticks. So, when contemplating what I was going to do this summer, LtN was always on my mind. One morning, while sitting at my desk checking email, I received notification of an endowed fellowship sponsored by the University’s PACE Center for Civic Service. The fellowship, a design-your-own internship in conjunction with an organization/mentor, became immediately synonymous with Lacrosse the Nations for me. I think I called my mom first, and then instantly called Javier. In two short days, I was interviewing for the fellowship, and only a few short weeks later, I had been accepted as a John C. Bogle ‘51 Fellow for the summer. And this is what brought me back to Charlottesville to enrich my service to LtN and help to ensure the future success of the domestic programs that LtN has been fostering ever since my initial involvement. This summer in Charlottesville has not always been smooth sailing, but once we worked out some of the kinks, we saw great improvement. The enthusiasm and engagement that resulted from a more structured curriculum and more directed implementation of life lessons only enriched the experience of every player and made their progress that much more perceptible to our coaching staff. Two of our superstar award winners after the practice that focused on perseverance and hard work. A couple laughs on our last day of practice! Group picture after our final practice. Can't wait to see some of these lacrosse players back in the fall! It was a rewarding experience to see growth in the players that we worked with this summer. We got to see them progress from catching their first pass, to scoring their first goal, to playing successful defense and beyond. To see someone else excel at a sport that has brought me so much success is transformative and heart warming. For me, though, an even more rewarding experience was to watch how the players’ demeanor changed throughout our 6 weeks of lacrosse practices. At the beginning, some players lacked focus or enthusiasm and were easily frustrated by the difficulty of mastering fundamental lacrosse skills. By the end, every player demonstrated enthusiasm, willpower and determination; these qualities quickly translated to success on the lacrosse field. This was obvious to the coaches and I think it was obvious to the other players as well. It was so exciting to see the scrimmages progress from a scrum of players all going after the same ground-ball to a more organized offense with kids getting open off cuts, calling for the ball, and everyone marking up on defense. Overall, the combination of progress in attitude and progress on the lacrosse field made for an overwhelmingly successful summer. Implementing a full six week organized practice scheme, with life lessons and lacrosse drills included, helped to bring structure and success to the players and coaches. 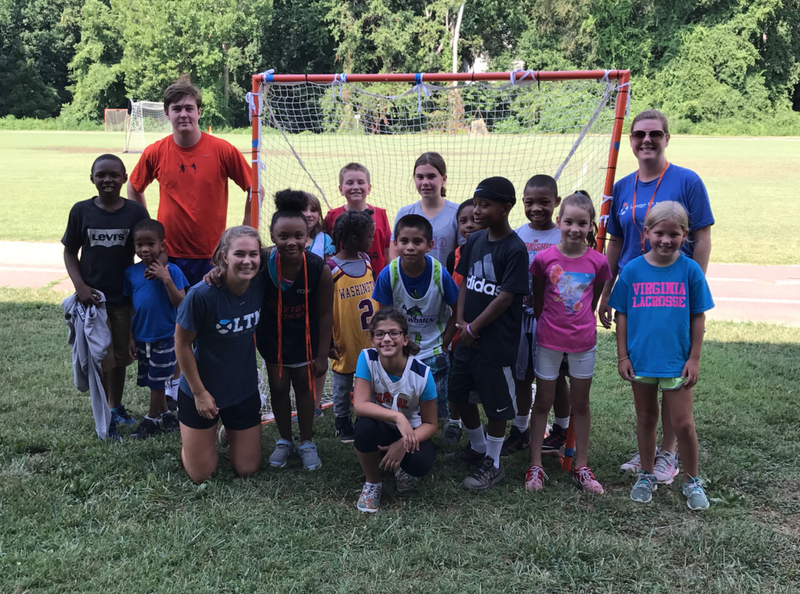 We are extremely excited to see the continued success of the Charlottesville programs as a number of UVA students carry out the life lessons and practice plans in the fall and we hope to see similar success at LtN programs in other parts of the US.